The Florida circuit courts are state courts, and are trial courts of original jurisdiction for most controversies. 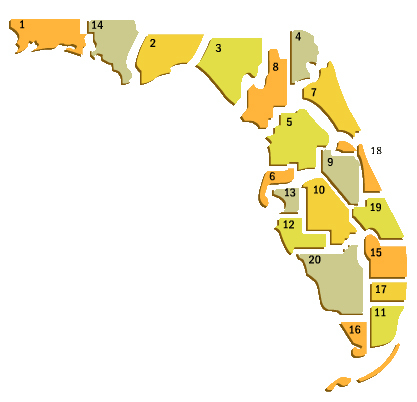 In Florida, the circuit courts are one of four types of courts created by the Florida Constitution (the other three being The Florida Supreme Court, Florida District Courts of Appeal, and Florida County Courts). The circuit courts primarily handle civil cases where the amount in controversy is greater than $15,000, and felony criminal cases, as well as appeals from county courts. Florida circuit courts have original jurisdiction not vested in the county courts, direct review of administrative action, and the power to issue writs of mandamus, quo warranto, certiorari, prohibition, and habeas corpus, as well as any other writs necessary to exercise their jurisdiction. "[A]ll actions at law not cognizable by the county courts . . . ." Therefore, all actions except: most misdemeanor cases, violations of municipal and county ordinances, some disputes occurring in homeowners' associations, and cases where the amount in controversy is equal to or less than $15,000 ("Exclusive of interest, costs, attorneys fees, except those within the exclusive jurisdiction of the circuit courts"). "[P]roceedings relating to the settlement of the estates of decedents and minors, the granting of letters testamentary, guardianship, involuntary hospitalization, the determination of incompetency, and other jurisdiction usually pertaining to courts of probate . . . ."
All cases of equity, including those related to juveniles, except for traffic offenses. All cases involving the legality of state tax assessment, toll, or denial of refund. Ejectment (But not eviction, which may be brought in county court). Title and boundaries of real property. Appeals from county courts (except from orders or judgments declaring invalid a state statute or provision of the State Constitution, or any orders or judgments certified by the county court as a matter of great public importance and accepted for review by a District Court of Appeal). Appeals from final administrative orders of local government code enforcement boards. ^ Fla. Stat. § 26.012(5) (2007). ^ Fla. Const. of 1968, Art. V, § 1 (1998). ^ "General Information". Florida's Circuit Courts. State of Florida. Retrieved November 26, 2007. ^ Fla. Const. of 1968, Art. V, § 5(b) (1972). ^ Fla. Stat. §§ 26.012(3), (4) (2007). ^ Fla. Stat. § 26.012(2)(a) (2007). ^ Fla. Stat. § 34.01(1) (2007). ^ Fla. Stat. § 26.012(2)(b) (2007). ^ Fla. Stat. § 26.012(2)(c) (2007). ^ Fla. Stat. § 26.012(2)(d) (2007). ^ Fla. Stat. § 26.012(2)(e) (2007). ^ Fla. Stat. § 26.012(2)(f) (2007). ^ See Pro-Art Dental Lab, Inc. v. V-Strategic Group, LLC, 986 So. 2d 1244, 1246-49 (Fla. 2008). ^ Fla. Stat. § 26.012(2)(g) (2007). ^ Fla. Stat. § 26.012(1) (2007). ^ State of Florida. "General Information". Florida's Circuit Courts. Retrieved January 13, 2009. This page was last edited on 3 March 2019, at 01:41 (UTC).